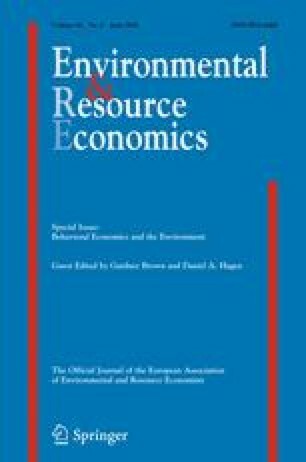 This paper reviews some recent research in “behavioural economics” with an application to environmental issues. Empirical results from behavioural economics provide a reminder that human behaviour is context-dependent, implying that policy may go awry if based upon models of behaviour which are inappropriate to the contexts in which decisions are made. Recognizing that agents may, in some contexts, systematically make mistakes raises challenging questions about the role of “paternalism” in government policy. The paper considers the research into hyperbolic discounting, and examines the implications for environmental policy. We develop a model of resource management under hyperbolic discounting, which shows that if a planner is unable to commit to a policy, the temptation to re-evaluate the policy in future could lead to an inadvertent collapse in the stocks of a natural resource. The authors gratefully acknowledge financial support from the UK Engineering and Physical Sciences Research Council under grant EP/H03062X/1.